Large Head. The Charles Barber design. 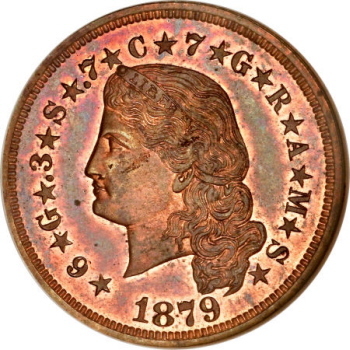 On the obverse the head of Liberty, hair flowing down below her neck, faces left, with the inscription (each character separated by stars) 6 G .3 S .7 C 7 G R A M S around the rim. She wears a coronet bearing the word LIBERTY, and the date 1879 is below. 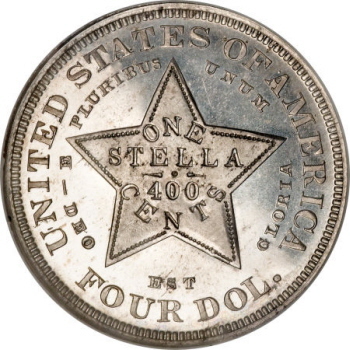 On the reverse a five-pointed star occupies the center, bearing the legend ONE STELLA / 400 CENTS. In an inner circle are E PLURIBUS UNUM and DEO EST GLORIA ("God is glory"), with UNITED STATES OF AMERICA and FOUR DOL. around the outer rim. Struck in copper with a reeded edge. The reverse and the obverse periphery are the same as the Judd-1635 through 1637 stellas, but the center obverse features the George T. Morgan Coiled Hair design. Liberty's hair is braided, and a hair band in front reads LIBERTY. Struck in aluminum with a reeded edge. Until the late 1880s and early 1890s when a new chemical isolation process was discovered, aluminum was considered among the most precious of metals, far rarer and much more coveted than gold. It is difficult today to find adequate words to express how elusive pure aluminum was at the time this coin was struck. We have mentioned elsewhere in this catalog the story of how when the Emperor Napoleon served an imperial dinner of elaborate scale, he reserved the aluminum tableware for the most revered guests, reserving the gold service for those of lower estate. Until the early 1880s, aluminum was sold in troy-ounce quantities, and domestic yearly production was in the range of 1,000 to 3,000 troy ounces, according to the U.S. Geological Survey. The Charles Barber design. 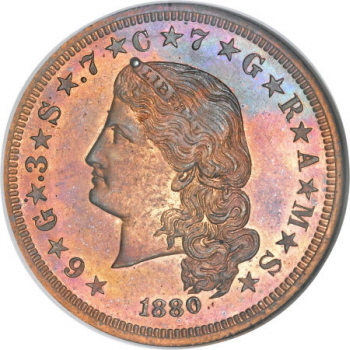 On the obverse the head of Liberty, hair flowing down below her neck, faces left, with the inscription (each character separated by stars) 6 G .3 S .7 C 7 G R A M S around the rim. She wears a coronet bearing the word LIBERTY in her hair, and the date 1880 is below. 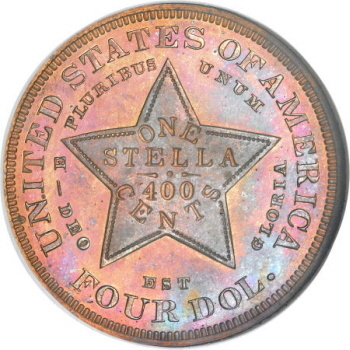 On the reverse (common to all 1879 and 1880 stellas) a five-pointed star occupies the center, bearing the legend ONE STELLA / 400 CENTS. In an inner circle are E PLURIBUS UNUM and DEO EST GLORIA ("God is glory"), with UNITED STATES OF AMERICA and FOUR DOL. around the outer rim. Struck in copper with a reeded edge. 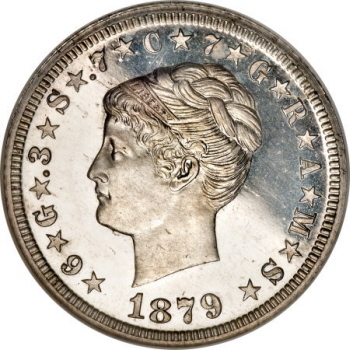 When one compares the obverse of the 1880 Flowing Hair stellas against the 1879 obverse, one notes that the date is markedly smaller and shifted, nearly touching the lowest hair curls and well separated from the denticles on the 1880 pieces, while the 1879s show a larger date, centered under the truncation, close to the denticles and the hair. "Dr. Judd, whose name appeared on United States Pattern, Trial, and Experimental Pieces, copyrighted in 1959 but distributed in 1961 by Whitman Publishing Company, was a medical doctor in Omaha, Nebraska. Judd enjoyed coins immensely and collected patterns extensively, but to say he was a dedicated scholar would not be correct. Rather, he appreciated pieces for their beauty. Abe Kosoff urged him to finance the research for a reference work, and eventually a book was published under Dr. Judd's name. However, nearly all of the information in the first edition came either from the 1913 Adams-Woodin text on the subject or from Walter H. Breen, who did much research in the National Archives. Relatively little work was done by Dr. Judd himself, although his contribution was valuable if for no other reason than he served as a clearing house for what others did." 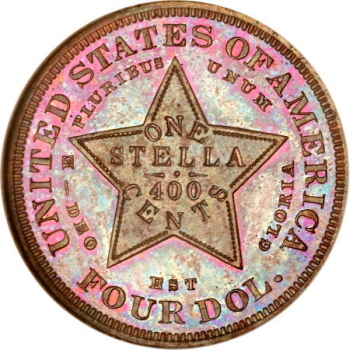 Although his "book" has now been through nine editions as of this writing, the U.S. pattern coin series continues to be attributed by "Judd numbers."